Prayer Beads in Sekiro Shadows Die Twice are a very important and hard-to-get collectible in the game, which can be used to increase your Vitality and Posture. Given how important these are, a lot of you might be wondering where to find or how to get Sekiro Prayer beads. So, please enjoy our Sekiro Prayer Bead Locations for the Peak Physical Strength Trophy guide, in which we will aim to show you where to find prayer beads in Sekiro: Shadows Die Twice, as well as how to use them to increase your Vitality and Posture. SPOILER ALERT: There will be some heavy spoilers in this article. Proceed at your own risk. NOTE: This guide is a work in progress. We’ll keep updating it with further information as we uncover it. Where to Find Ashina Outskirts Prayer Beads in Sekiro Shadows Die Twice? To find Prayer Beads in Sekiro, you’ll have to search a bunch of hard-to-find chests, and / or kill some mini bosses. For example, General Naomori Kawarada, who can be found on the grounds of Ashina Outskirts, near the Ashina Outskirts Wall – Stairway Sculptors Idol. Another Prayer Bead-dropping boss is the Chained Ogre, whom you can also meet on the Ashina Outskirts. He’s the huge guy with his head still stuck in stocks. You can reach him pretty easily from the Outskirts Wall – Stairway Sculptor’s Idol. Drop down into the courtyard and kill the regular enemies, then head up the large staircase. You’ll find the Chained Ogre imprisoned at the top. You can get a couple of hits in before he breaks free, so make them count. Also in Ashina Outskirts, there’s an NPC called Tengu of Ashina, who you can find after killing the Gyoubu Oniwa boss. There’s a staircase next to Tengu, from which you can grapple up the rafters until you reach the roof. In there, you can find a chest from which a Prayer Bead drops. For the exact location, check out our article titled Sekiro Secret Treasure Chest Locations. Other bosses that drop Prayer Beads include the likes of General Tenzeb Yamauchi. To find him, go towards where the Chained Ogre is (explained above), and use the grappling hook to get above the gate. Head to the right and drop down into the courtyard. General Yamauchi is patrolling said courtyard. The Blazing Bull, a non-optional boss that will ambush you as you’re making you’re way forward, will drop a prayer bead when you turn it into steaks. 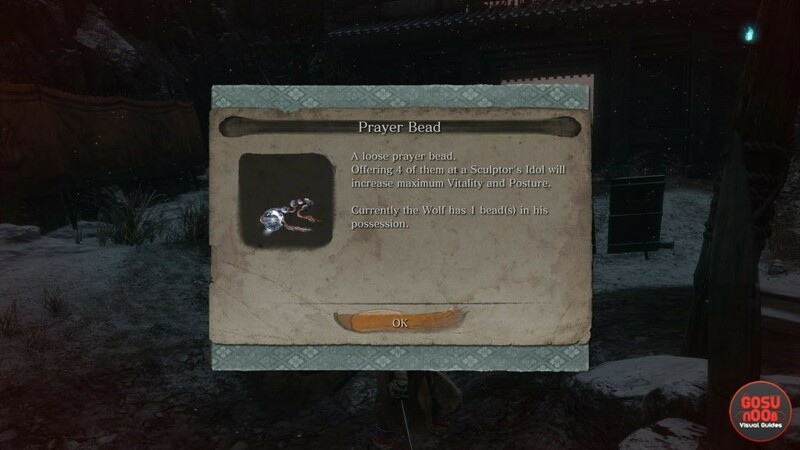 Prayer Bead in Sekiro Ashina Castle – Where to Find? From the Ashina Castle Upper Tower – Antechamber idol, head up the stairs and turn right. Head through the next room, and into the wide open room after that. Mind the enemies; be as stealthy as you can. Head to the right, then left. Kill the two more enemies, and approach the painting between two sets of armor. This will take you into a secret room. Inside is a chest, with a prayer bead inside. Near Ashina Reservoir, as you explore, you’ll come across an NPC called Jinzaemon, whose listening to something coming from the hole in the ground. In the hole, you’ll come across a mini boss called Lone Shadow Longswordsman. Defeating him will earn you a Prayer Bead and passage into the Abandoned Dungeon, but more on that later. Near the first idol in the area, Ashina Castle, go upstairs and clear the riflemen and kill General Kuranosuke Matsumoto to earn a bead. A little further down the road, near the Abandoned Dungeon Entrance idol, you’ll meet one of the Memorial Mob merchants. They’ll sell you a bead for 1400 gold. Further in the Ashina Castle region, not far from the Upper Tower – Ashina Dojo idol, you’ll have the honor to battle Ashina Elite – Jinsuke Saze. Like all bosses, killing him will reward you with a prayer bead. Near the Upper Tower – Antichamber idol, you can come across a large room with a bridge across it. Below the bridge, you can find a Chained Ogre later in the game. Like the one before, the reward for killing it is a bead. This, and the rest of the stuff we’ll mention, is only available later in the game. Further in, next to the Upper Tower – Ashina Dojo idol, you’ll battle Lone Shadow Vilehand. Kill him to obtain a bead. Travel to the Great Serpent Shrine, and there you’ll meet Lone Shadow Masanaga. Defeat the enemy and collect your Prayer Bead. Now, there are three bosses you can battle in Ashina Castle only after you’ve killed the Divine Dragon in the Fountainhead Palace area. After you manage to pull it off, the game will transport you back to Ashina Castle. The bosses are Seven Spears Ashina – Shume Masaji Oniwa near the Ashina Reservoir idol, Shigekichi of the Red Guard (across the bridge downstairs from the Old Grave idol), and Ujinari Mizou (from the Upper Tower Dojo, go downstairs and look behind you to find a paper wall that you can cut and reveal a secret passage leading to the boss). Yet another boss that drops a Prayer Bead is Shinobi Hunter Enshin of Misen, whom you can encounter near the Hirata Estate area. There’s a well you can drop into, then proceed to jump into the water and head to the right. When you come near the bridge above you, you’ll also get a grappling point you can use. Head left into the tall flowers to hide. Shinobi Hunter Enshin is one of the enemies on the road; he’s wearing a white hood. You can attack him from cover in order to do massive damage before attacking head-on. As you go through the Hirata Estate zone, sooner or later, you’re going to come across the boss Juzou the Drunkard and his lackeys. When you do kill him, he’ll drop another Prayer Bead for you, as well as some Unrefined Sake. In the Hirata Estate region, there’s a hidden treasure chest near the Hirata Audience Chamber idol, after you’ve slain Juzou. You have to go deeper into the building, and find a dead end with a painting on the wall. You can then hug the wall in order to find a secret area, full of all kinds of good stuff, including the chest with a prayer bead. Again, check out our above-linked Secret Treasure Chests guide for more detailed instructions. When you revisit Hirata Estate in the Purification ending, you can fight Lone Shadow Masanaga the Spear-Bearer near the Bamboo Thicket Slope idol. He’ll be waiting where Owl gave you the key to the state earlier in the game. Also during the Purification ending, you can fight Jizuo the Drunkard once more in the vicinity of the Hirata Estate Main Hall idol, and he’ll reward you with yet another bead. Where to Find Prayer Beads in Sunken Valley? From the idol called Sunken Valley – Under-Shrine Valley, head across the chasm by jumping and using the grappling hook. Kill the enemies, and look to the left. There’s a ledge above you. To grab it, you’ll have to jump, then jump of the wall again and quickly grab onto the ledge. Might take a few tries. Hug the wall and walk across the narrow path until it widens. Drop down into the area below, amid the spooky statues. That’s where another Prayer Bead will be. As you make your way further down Sunken Valley, downhill from the Gun Fort Sculptor’s Idol, you’ll have the unfortunate honor of having to battle a monster called Long-Arm Centipede Giraffe. Yes, very really. Once you manage to down it, you’ll get a Prayer Bead. Be prepared to do a lot of deflecting and jumping for this one. Another enemy that will grant you a bead is Snake Eyes Shirafuji, who you’ll come across not far from (but very much below) the Sunken Valley idol. After killing Long-Arm Centipede Giraffe, look for a hole in the floor. Go through the narrow tunnel and look up and to the left when you reach the ledge. Grapple up, then grapple to the right. Explore this new path, and you’ll find a bead near the dead end with the lizards. As you plunge into the Ashina Depths, depending on which way you’ve taken, you’ll come across the Poison Pool area, where you’ll be welcomed by the gun-toting Snake Eyes Shirahagi. Since you’re dealing with a mini boss, she also drops a prayer bead. In the small tunnel after the battle with Shirahagi, you can grapple to the left. From there, you can reach the head of one of the statues that surround the arena, and find the Prayer Bead on it. Later down in the Depths, you’ll stumble upon the Guardian Ape’s Lair. Not only will the white ape attack you, but it will summon a buddy. As far as we can tell, though, the buddy gives up when you dispatch the white ape, and they’ll drop a prayer bead each. While making your way through the mist leading to Mibu Village, in the Hidden Forest, you’ll come across Tokujiro the Glutton, an encounter reminiscent of Jizuo the Drunkard. Kill him, and pick up the bead. Going through Mibu Village, you’ll cross paths with the mini boss called O’Rin of the Water. She’s in the vicinity of the Watermill idol. Kill her and receive a prayer bead. When you come across a large locked house in Mibu Village, near the Corrupted Monk battle, crawl under the house. The house I’m talking about is the one besieged by several monsters. Explore around below the house, and you’ll find a place in the floor that you can use to go inside. There’s a bunch of items there, as well as a Prayer Bead on a Buddha statue. From the Temple Grounds idol in Senpou Temple, go downhill and hug the cliff wall on the left. When you reach the edge, jump down into the water. Look for a greenish glow in the distance, and swim towards it. You’ll find a prayer bead in the arms of a Buddha statue. Mind you, you can only reach this after getting the ability to dive and stay underwater. Near the same temple, there’s a big building on the right wherein another Centipede Giraffe attacks. Use the same tactic as before, and you’ll get that bead in no time. As you explore Senpou Temple, you’ll come across the Armored Warrior. He’s tricky to defeat, but when you do, guess what you’ll get? A bead. From the Pot Noble idol in the Fountainhead Palace, hop into the water of Giant Carp Lake. Explore around until you come across a huge fish skeleton, and a Headless enemy you’ll have to take out. Next to the fish skeleton is a chest, and the Prayer Bead is inside it. While you’re in Fountainhead Palace, especially around the lake, the Okami Leader boss will be pelting you with lightning. When you figure out how to reach him and kill him, he’ll drop a Prayer Bead. If you explore Fountainhead Palace thoroughly, you’ll come across a purple bull near Mibu Manor. The enemy’s name is Sakura Bull, and the reward for defeating it is yet another Prayer Bead. It’s near the weird Lovecraftian squids, but you’ll have to grapple over the buildings to the other side of the “complex”. How to Use Sekiro Prayer Beads? To use Prayer Beads in Sekiro Shadows Die Twice, you’ll first have to collect four of them. Once you do, take them to your nearest convenient Sculptor’s Idol. Use Enhance Physical Attributes in the menu. This will join the four Prayer Beads into a Prayer Necklace. In turn, this action will increase both your Vitality and Posture by one point. In case you need more help with the many different collectibles in Sekiro, you can check out our Buddha Statue Offering Locations guide and our Gourd Seed Locations – How to Upgrade Healing Gourd guide. These hints are gold for me. Thanks, now I can get trough the game.